Russian World Forums • View topic - Another visit to Russia! Post subject: Re: Another visit to Russia! I am glad to hear you are back in Terra Firma and you had a good time with Natasha in Moscow and St Petersburg. Thank you very much for your travel reporting and was interesting to know your latest impressions of Moscow and Peters. My wife and I we had to opportunity to watch live on RT the great parade but I don't think this year was any better than previous years but courtesy of RT TV I posted few photos to commemorate the day, as our Board called Russian world! Of course I am looking forward to your original photos and if you need any help.... just let me know. 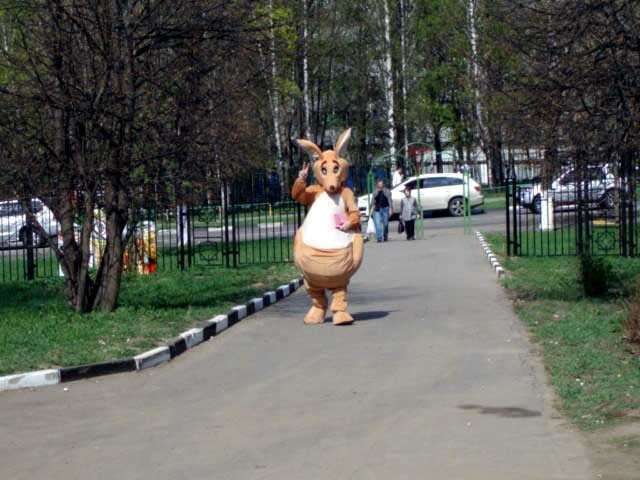 Who said they do not have kangaroos in Moscow? Even at MSU they were getting into the May 9th moment. Why do they always show Pushkin with his wife as I thought he was a player? In St. Petersburg the first day! just don't go see Madam Butterfly there. Singer building: So I guess the sewing machines were popular before the revolution! Tourist trap carriage ride at the Hermitage! to revolution with the way the nobility lived. On the grounds of Catherines Palace. Table set for a king or czar. Tasty food at an Armenian restaurant! Still more of St. Petersburg.! This Georgian pie was pretty tasty! Was not tempted to go on another river cruise after Moscow. Like in the west, a good celebration ends with fireworks! One of the many stages. Joining the party in central Moscow. Stopped off at a Mu-Mu's after the parade (BTW, my favorite for good Russian food at a good price). I would not want to be on the receiving end of that ICBM. Thanks for posting your photographs. Great photos wicheese, thanks for sharing. I really really really really want to go back to St. Pete's now! Great photos Cheesy........ and an excellent travel report.